"Hey, my mom wants to go for Dim Sum tomorrow", Viv yells out from the living room. For the love of... Shoot me now will you. Better yet, just feed me some recalled beef products. That way, with a heavy dose of e-coli, it would give me an excuse not to go. "Oh and she wants to go to Dung Sing Chin again", Viv adds. OMFG. No offense to the place, but must we always go to the same place??? It's either there or Fortune City. I guess they are really set in their ways. As an alternative, I suggested that we try somewhere new or at the very least some place we haven't been to in awhile. Ultimately, my mother-in-law decided to veto almost every restaurant that we could come up with. Excuses ranged from "too far" to "too noisy". WTF? Dim Sum is not Dim Sum without some old lady screaming at the top of her lungs at the next table! Wait, that would just be my mother-in-law at our table... Anyways, I finally threw a hissy-fit that would make Veruca Salt look docile. That, in turn, allowed us to head over to our first choice, which was King's Chinese Cuisine. Apparently a local favourite, their draw is reasonable prices and decent eats. pork filling ratio. 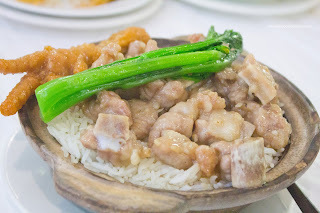 However, the pork was slightly dry and pretty bland (as was the taro). At the very least, it wasn't oily and was basically acceptable. Right on cue, my son went back to his old ways and we had to get the Soy-Fried Rice Noodle Rolls. As evidenced in the picture, these were not all that deep in colour nor was there a whole lot of caramelization. 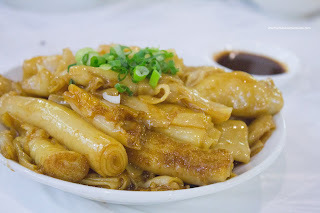 The result was pretty much bland rice noodle rolls that needed an extra side of sweet soy. Furthermore, the noodles were missing that pan-fried flavour. Rather, it was as if they had tossed it in luke-warm oil and light soy sauce. 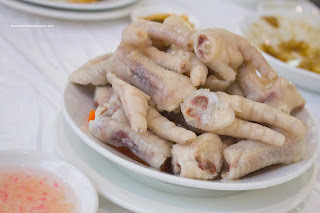 When my MIL finally arrived, she ordered a few of her favourites including the Jellied Chicken Feet. Yes, sounds delish eh? Well, it is more of a textural experience than anything else where the skin and gelatin are usually prepared so there is a certain resistance and snap. The one we had here was a touch on the undercooked side and slightly bland as well. My MIL proceeded to berate our server regarding the dish's deficiencies to our utter horror and embarrassment. Tact is not one of her strengths... Did she really want our food to arrive with "extra" ingredients or worse... "sauce"??? A very good reason to avoid eating out with her. 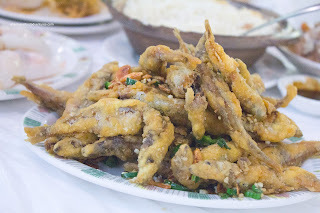 Anyways, another one of her choices was the Deep Fried Smelt tossed in salt, garlic and chilies. This was a pretty decent attempt with lots of smelt with the requisite roe. The batter was slightly heavy, yet not terribly so. Despite the appearance of plenty of chilies and garlic, the dish was actually quite mild tasting and according to Viv, not impactful. I didn't mind it and appreciated the lack of grease. Moving onto the Shrimp Rice Noodle Roll, it was pretty stiff and doughy. The shrimp were pretty small and despite being properly textured, had very little impact. 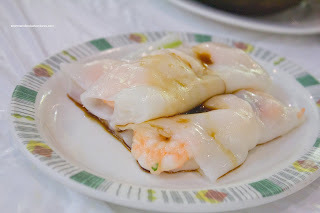 Continuing on the topic of shrimp, the Haw Gow were pretty average. The dumpling skin was wet and gummy while the shrimp/shrimp mousse filling was a touch soft. There was not much in the way of a snap from the shrimp mix. On a positive note, they were large and seasoned properly with a good balance of flavours. 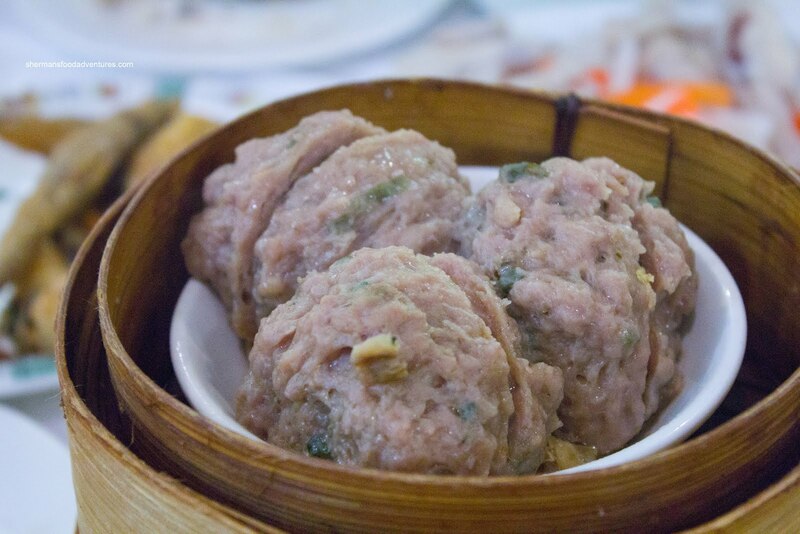 On the other hand, the Sui Mai were more of a one-note taste wonder. All I got was sweetness and little in the way of savouriness. The meat was dense and not really all that bouncy in texture. At least it wasn't very fatty, which in theory could've contributed to the dense texture. Furthermore, they were a touch pale looking, which does matter since we eat with our eyes first. Now something with good texture was the Beef Meatballs. This is not as easy as it appears. Properly textured balls are a work of art. Er... Wait that's a bad analogy, unless we were talking about art history in Europe. Let me rephrase that. To achieve the desired "not-naturally-occurring" bounce meat texture, corn starch and baking soda plus a whole lot of food processing are involved. I'm sure you could in theory bounce one of these meatballs on the ground. Actually, I once dropped a Vietnamese beef meatball and it literally bounced across the kitchen (mind you, that is a totally different texture). Makes you wonder how unnatural that is... Enough of my random blabbering, the beef meatballs here were the proper texture with a good mix of water chestnuts and green onion. Now if you look at exhibit A, you will find a crime scene of severed Chicken Feet. 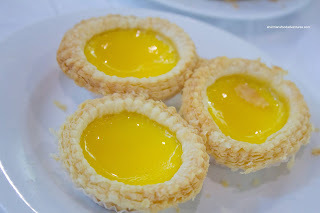 Yah, I know it is a typical Dim Sum dish, but really, these were terrible. 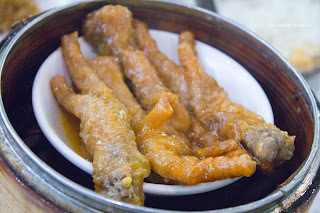 So much so, it resembled more like butchered chicken feet than something we'd want to eat. These were pale and obviously not fried correctly. Usually, chicken feet are fried in all of the old oil because there is no need to use new oil (I bet you didn't want to know this...). Hence the dark colour is a result of that oil. Sometimes you can taste it, if the chicken feet aren't prepared properly. These pathetic things were scrawny and bland. Probably one of the worst versions we've ever had. Okay, I'll admit it. I am a glutton for punishment. Why? 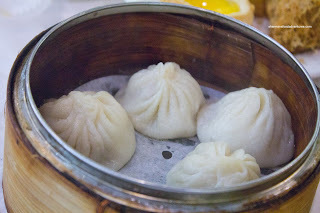 Well, why else would I order Xiao Long Bao at a Cantonese Dim Sum service? It could be plain stupidity as well... Whatever the case, we had low expectations. These XLBs pretty much met those expectations with very little soup (which was more like melted fat). Furthermore, the meat filling was one-note in flavour (pork tasting) without any ginger hit. 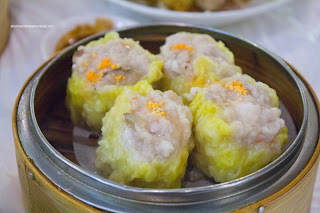 However, the dumpling skin wasn't too thick nor was the meat too gritty. Therefore, for what it was, it was a decent dumpling (just not an XLB). For our filler item, we got the Sparerib Rice which included another chicken foot and a stalk of yau choy. There was a good amount of meaty pork spareribs on top, however, they were on the softer side with little chew. They were well-seasoned without being salty. The rice was mostly dry and chewy except for a few wet spots. 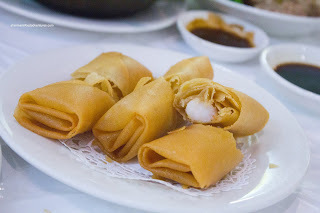 Lastly, we got the Shrimp Spring Rolls because he loves the fried wrapper. Yes, he doesn't prefer the filling so much. Well, there wasn't much issue here since the spring roll had barely any shrimp inside. And the ones that we found were completely lost in the crunchy wrapper. If they were going to be so skimpy with the shrimp, they should've just offered a regular spring roll consisting of veggies and pork. At the very least, the rolls were not greasy. As you can clearly ascertain, the Dim Sum at King's was pretty hit and miss. Of course, with such a small restaurant, it would be unfair to expect top notch Dim Su m. With that being said, we've been to some small places (such as Good Choice) and they've been better. 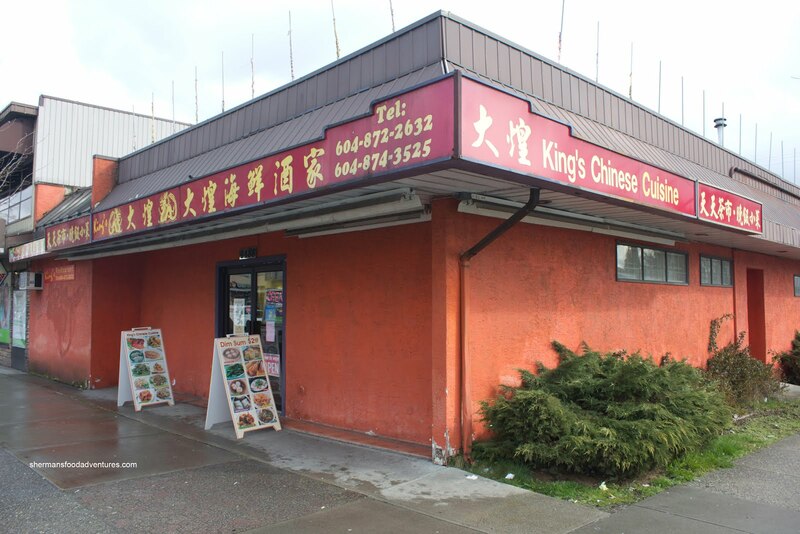 Yet, with reasonable prices and decent service, King's serves their local clientele well. 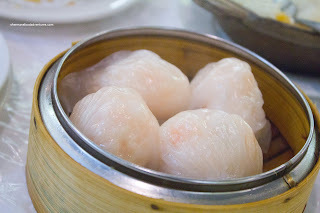 Sherman, you really threw a hissy fit over dim sum? I swear, you must have a fair share of female hormones. Anyways, welcome to the circle of girlie foodies. keke. ps Will definitely avoid this restaurant. If I have to have dim sum, I want it to be a positive experience. I hope your MIL doesn't read your blog postings. 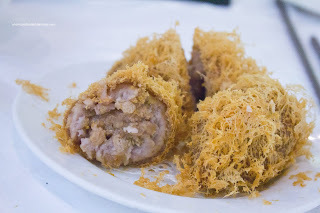 To keep on topic, King's dim sum is quite decent, esp. for the price segment. Well in case Sherman's MIL does read it, he could use a code word next time to stay under the radar. BTW, he can use "Jang Mo Jib" as code for MIL (look it up). "The Bad: A bit dark inside"
Was that right after MIL (or "JMJ") arrived ? Sometimes I skip to the bottom first to see what LR has written, hahaha. @holly If you've met my MIL, you'd throw a hissy fit too. Yah, the food was not terrible, but there is definitely better (such as at Good Choice). @Shonagh I hope not either! @LR Yah, I agree, not terrible, but not great either. Reasonably priced though. No need for code. I'll just keep taking my chances.